Our Gandoca Nighttime Turtle Watching will give you the opportunity to travel through time! Go back to the beginning of evolution, represented by the nesting of these live fossils. 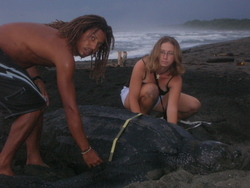 The leatherback turtle is the biggest turtle in the world. It can be as large as 2 meters long and weigh 650 kg! In this unforgettable night walk along the Gandoca Beach and you will experience a different perspective of this spectacular experience. You will observe these mothers in the important work of laying eggs. You will also learn important things about the natural history of these special animals in danger of extinction. Help us with the protection of sea turtles! The trip starts with pickup at your hotel and transportation to the small remote village of Gandoca. At the end of the trip, you are brought back to your hotel. Please remember that these living animals are free. We cannot guarantee that you will see turtles during the tour. Also, please note that neither flashlights nor photography are permitted on the beach in turtle nesting areas. They disorient the turtles! I believe we were very lucky and actually saw two leatherback turtles on the beach laying eggs which was amazing! We could have seen a third one if we could have stayed awake long enough! This is a seasonal tour, generally from March – June. There is a minimum of 2pax for this tour. Cost without transportation is $55.00 for adults, $30.00 for children – choose pickup city Gandoca on booking tab and pickup point “office”. This is a night-time trip to a remote location, this option is only recommended if you are accompanied by someone very familiar with the area. What to bring: Hiking shoes (you will be in the jungle and on the beach so flip-flops are not recommended), dark colored clothing, long pants, insect repellent.